For today's DIY Friday we're thrilled to feature our friend and fellow natural beauty advocate, Grimes. 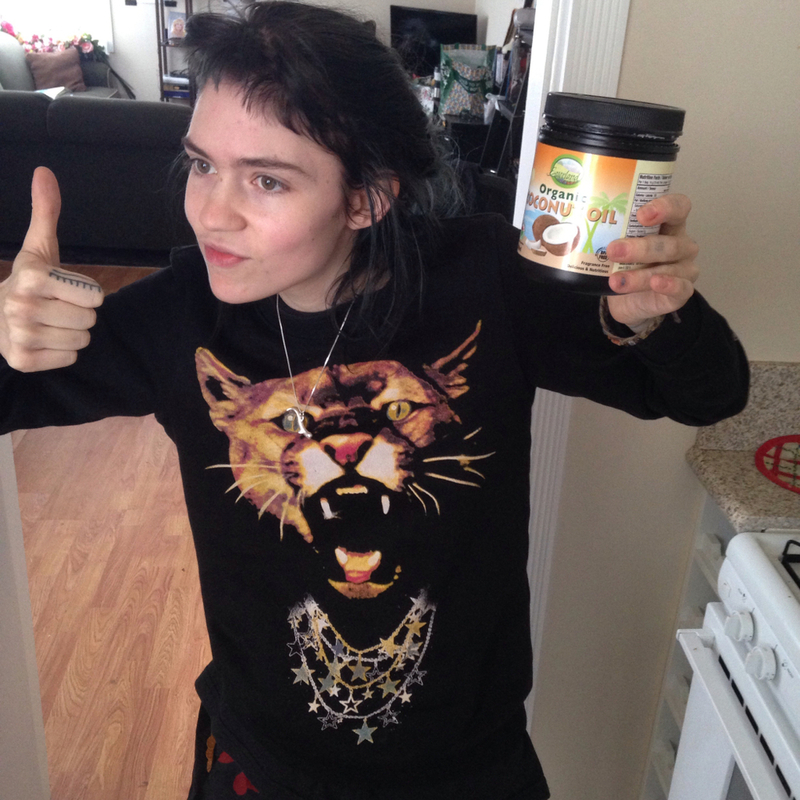 Grimes loves coconut oil too!! Sugar works pretty much as well as any store bought exfoliator I've ever used and you can get it for free at any coffee place basically, (although you should probably buy a coffee if it isn't a big chain, or just buy your own sugar). Wet your face, put a bit of sugar on your hands and gently rub all over your face. I guess a concern is that it can be a bit harsh if you have sensitive skin. If that's an issue I've always been down with the Burt's Bees exfoliants, because they are free of plastic microbeads and toxic chemicals. Coconut oil is good in food and as a moisturizer on skin, hair etc. so it's definitely a $$ saver. It doesn't screw my skin up when I use it as an overnight mask on my face. It tastes really good if you use it for lip gloss as well, although it dissipates quickly or maybe you just end up eating it haha. As a hair mask almond oil is probably better though. I discovered this because my Step-dad's Mom used it back in India in the 50's. But yeah, when I bleach my hair (definitely not a chemical free process haha…) I just lather it in almond oil and it really helps. It's also delicious in food but it's a lot pricier than coconut oil and usually comes in a smaller bottle, but if you only use it as a hair mask it will last for a long time. Maybe this is not dermatologist recommended haha, but putting a bit on a cloth and dabbing on your face works pretty nicely as a facial peel. But again - I do not have sensitive skin so this might screw up some people. I looove perfume. I find the process of making it to be incredibly fascinating and romantic and kind of goth. Plus it seems like a pretty healthy alternative to deodorant in general. But yeah, when I was living outside I really liked using vanilla extract. In addition to being cheap, it has multiple purposes and smells amazing. Lavender and ginger extracts are also really nice as 'perfumes'. I'm in the process of discovering chemical free brands lately as well because it's a bit more reliable than just using cooking supplies haha. A makeup artist just got me into this company called Elegant Minerals. It's definitely for 'crazier' looks or costumes - I usually wear white and dilute it with water for a mild vampire look. Sometimes I mix it with moisturizer and use it very lightly as regular day makeup but that's because I'm unhealthily pale. The colours are really good for eyeshadow etc. but can smudge easily. It's still infinitely better than any traditional face paints I've ever found though in terms of not being flaky.